Today finally my E71 using SW version 410.21.010 has discovered new firmware update available. Newest version is described as 500.21.009. Number suggests bigger changes than last time. I have read some rumors about this software in last few days, but so far my phone with Polish product code and no operator customization couldn’t see it available. Today finally did it. As usual I recommend doing your phone memory copy before you decide to flash your phone. You can easily do it with new Ovi Suite 2 or some older tools. Flashing can be nicely done with Ovi Suite or if you like to be tester.. beta version of new Nokia Software Updater available via Beta Labs. Please keep in mind that if you have phone customized with operator’s variant the update may not be yet available for your E71. Last week Nokia has released one more official software update for our beloved E71. New firmware – 410.21.010 should be available via Nokia Software Updater, or Nokia Ovi Suite 2 for most of devices. Please remember that for some product codes, especially those with operators’ customization, it may be available later. Nevertheless, what’s inside? This update seems to be smaller bug-fixing and component updating release. It may help you with some stability issues plus having one of newest firmwares may be helpful in getting Ovi Maps with full drive and walk navigation for free. List of changes has been posted at E71 Fanatics blog in here. P.S. Please keep in mind to make a full backup copy of your phone memory before you start updating your phone’s software. As I have promised I will let you know if new official software for E71 will be available. Today I was texted by My Nokia service that new software is there. Nokia Software Updater tells the same. Please check your devices for 400.21.013 firmware and enjoy updating your phones! Remember, as usual the update may not be available for all product codes at once! 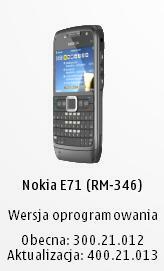 New Nokia E71 v300.21.012 firmware available! Today new software update for E71 has been officially released! New software marked as v300.21.012 is available vie Nokia Software Updater application. Check details here.